Pasadena, CA July 26, 2018—Hundreds of guests. Dozens of volunteers. 14 tablescape designers. And not one but two designers took the prize for “Favorite Tablescape” of the night. Yes, Leadership Pasadena’s first tablescape competition, Setting the Table: The Art of Conversation, ended in a tie! Dana Banta and Catie Roheim of The Monogrammed Home and Mikala Rahn along with students from her artWORKS program designed the two winning tablescapes as voted on by event guests. While the design teams produced distinctly different tableaus, both underscored the evening’s “conversation” theme and captured the attention of guests and fellow designers alike. Thanks to the generosity of DREAMS Magazine, each designer will be awarded a full-page color ad in the luxury publication. The dual awards were presented by the magazine’s Ty Fischer and Natalie Friberg following a spirited auction and prize drawing hosted by Artistic Director Anthony Guthmiller, with remarks by Leadership Pasadena’s Board Chair, Joshua Driskell and Executive Director Cynthia Bengtson. Both applauded the designers for their creativity and thanked the team at NOOR, generous sponsors, and dedicated volunteers who made the event possible. All proceeds from the evening will be used to fund the organization's community and Veterans training programs. Event guests included Pasadena Vice Mayor John Kennedy, Pasadena Fire Chief Bertral Washington, Leadership Pasadena board members and former students, event sponsors, and prominent business leaders and their guests. Photo 9: Jennifer Scibetta, Community Dir. and Charlotte Miles, Pres., Junior League of Pasadena, Inc. 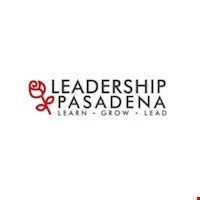 Established in 1999, Leadership Pasadena is a powerful, hands-on, community leadership program that immerses participants in Pasadena’s rich history, government, economics, and world-renowned institutions and also provides executive-level leadership training. This is an energized, dynamic program for those who want to play an active, collaborative role in Pasadena’s future. It challenges and engages emerging and existing leaders—who come from a diverse array of professions, communities, ages and passions—to gather around the table to openly discuss critical issues facing our community, with dignity and respect for all opinions.